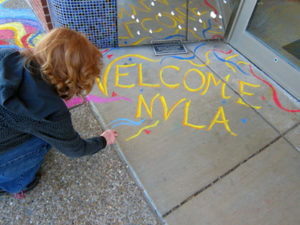 Welcomed by Chalk Riot (above), colleagues from across the country traveled to St. Louis on April 13, 2016, to attend the annual national volunteer lawyers for the arts conference. Each organization in our informal network operates independently. Most are nonprofit organizations, while others are housed within arts councils, law schools, arts services organizations or bar associations. The three-day conference featured roundtables and presentations on estate planning for artists, evaluation, the arts response to Ferguson (Roseann Weiss and Freida Wheaton), entrepreneurial training for artists and accounting services (Only three organizations in our network have accountants). Special guests included John Kirkpatrick from the US patent office (several organizations are running pro bono patent programs); James Daily, creater of the blog Law and the Multiverse; and Kevin Erickson, Future of Music Coalition. His presentation, Music and How the Money Flows, was based on a national study of musician revenue streams (There are 42!). A fascinating architectural bus tour led by Michael Allen, founder of the Preservation Research Office, was enjoyed by all. 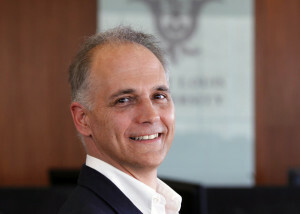 Jim Reeves, longtime volunteer and former board member, wrote an article about VLAA that appeared in the December 2015 issue of St. Louis Lawyer, a magazine published by the Bar Association of Metropolitan St. Louis. He explained how he first got involved with our organization, including helping start our mediation program; highlighted a recent assignment; and described the rewards of volunteering. Read his article. We hosted our second LLC Clinic on November 14, 2015. The program began with Brian Salmo’s brief presentation covering limited liability company basics. One-on-one consultations with the artists followed. Four law students attended the clinic, including Tammy Vaughn (left). “The LLC clinic was a great opportunity that I thoroughly enjoyed,” she said. “I sat in with David Koonce (right) and learned a significant amount of practical things that I can take with me into practice.” Thanks to Brian, David and the other clinic volunteers: Peggy Cavaness, Steve Gorin and Eric Hansen. To provide professional development opportunities across the state, our friends at the Missouri Arts Council asked us to record Dan Cohn’s Copyright Basics presentation. Cohn is a member of the Technology, Manufacturing & Transportation industry team at Husch Blackwell and serves on our board of directors. 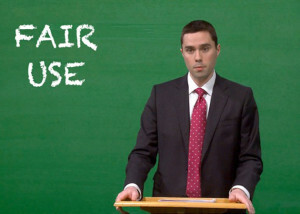 The video was taped in the University of Missouri-St. Louis production studio and was edited by Joe Hartmann, a Missouri Baptist University film student. You can see the fast-paced video here. 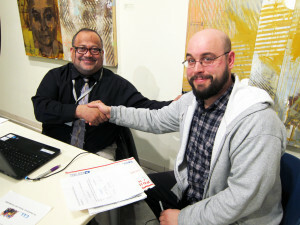 Tim Rakel (right) was among the artists who received one-on-one assistance with health insurance enrollment on January 14, 2014. 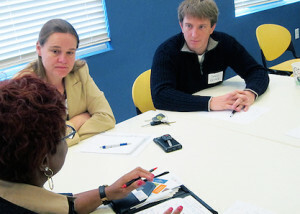 The session was co-sponsored by the Community Action Agency of St. Louis County, which sent four certified counselors, including James Lovings (left). We asked St. Louis-based artists to tell us their stories. Watch our videos here. To graduate on time, Maryville University B.F.A. 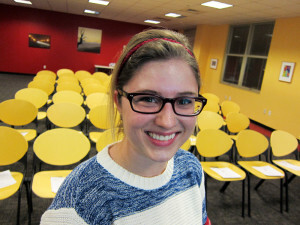 candidate Emily Stockwood needed to take a seminar course that was not offered in the fall. So, John Baltrushunas, director of the university’s studio art program, came up with a plan: Emily would get credit for attending our series of professional development seminars. “It was a good way to get my toes into the art world outside of the university bubble,” she said. Thanks to a new partnership with Gateway EITC Community Coalition, we offered free tax prepartion services to the residents of Metropolitan Artist Lofts and Leather Trades Artist Lofts. Both properties provide affordable housing for artists. “Everything was quick and painless,” said artist Matt Bloomberg (right). 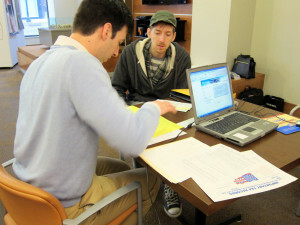 “Best tax experience ever!” Gateway EITC volunteer Lucas Gredell (left) is a portfolio financial analyst at US Bank. Twenty-eight (mostly visual) artists are tax savvy and marketing with greater confidence thanks to two Business Edge workshops presented in collaboration with Arts Rolla on January 28, 2012. 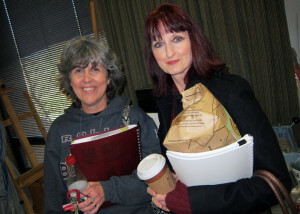 What did Colleen Kelley (pictured left with Sandy Chasteen), who works in pastels and acrylics, find most valuable? “Are you kidding — all of it! !” The morning session, Artist as Bookkeeper, covered recordkeeping, how the IRS distinguishes between a hobby and a business and Schedule C. Rita Choate, a Rolla-based tax preparer, co-presented with VLAA Executive Director Sue Greenberg. Marketing & Professional Presentation, presented by Greenberg after lunch, focused on basic strategies and pricing. The artists left with a thick packet of sample materials, such artist statements and elevator pitches, tip sheets and a marketing plan template. “I learned a lot. 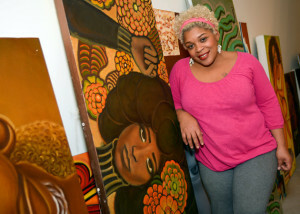 I think everyone did,” said Loretta Wallis (pictured right), president of Art Rolla. According the arts council’s administrator, Reba Fryer, the professional development program also boosted organization’s membership with one new member and two renewals. The Business Edge workshop was made possible by a grant from the Missouri Arts Council. Kristina Cho (left) believes artists need to know more about the law. Cho first heard about VLAA when she was an undergraduate communications design student at Washington University’s Sam Fox School of Design & Visual Arts. “One of the elective classes offered by the art school invited a speaker from VLAA to inform students about their legal rights. I felt this was an important topic that was not adequately addressed by the art school. So I focused my senior seminar project around the basics of intellectual property and used the project as a vehicle to introduce the topic to my peers,” Cho said. 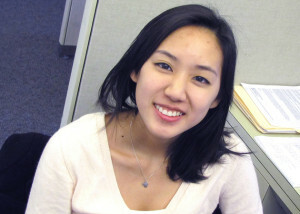 A first year student at the University of Virginia Law School, Cho spent part of her 2012 winter break volunteering at VLAA. During her whirlwind week, she wrote an article on website accessibility, summaries of eight tax cases addressing the difference between a hobby and a business, an explanation of the Sunshine Law for nonprofit arts organizations and a notice for filmmakers about how Missouri’s film tax credit may be eliminated. 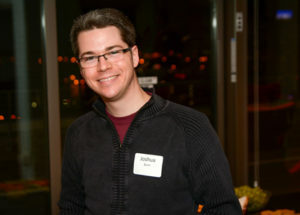 “Volunteering at VLAA has been a great experience. I’ve learned so much in a short time by doing hands-on work for the organization. I had a chance to practice my research and writing skills, speak with volunteers and meet VLAA clients. 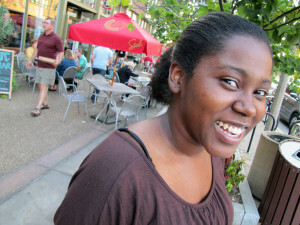 It’s great to see how far-reaching VLAA’s influence is in St. Louis,” she said. Virginia Law’s Winter Break Pro Bono Program provides an introduction to the skills and values that promote a lifetime commitment to law-related community service.